If you’re a newly-minted homeowner, you’re probably working through a list of home improvements, considering which projects to undertake. You’re dividing ‘essentials’ from ‘nice-to-haves’, and balancing upfront costs with return on investment. Smart Home technology is a fast, affordable improvement with immediate benefits. It makes your home safe and secure for your family, helps reduce energy waste for lower monthly bills, and even reduces insurance costs. Our systems include monitored home security and fire protection, smart thermostats, locks, and lights and even flood sensors —all accessed through a single smartphone app. They can be professionally installed in a few hours. The benefits are immediate, the upfront costs won’t break the bank, and thanks to our wireless technology, you don’t even have to mess up your newly painted walls. Security is at the core of an Alarm.com Smart Home, giving you security-grade protection combined with connected Smart Home features. Your system will communicate securely with a 24/7 monitoring station, staffed by teams of security professionals, ready to dispatch the police or fire department in an emergency. Our security-grade connected smoke and CO detectors will trigger several actions in an emergency to keep you protected. Your Smart Home will let you know right away if something is wrong. This enables you to deal with problems quickly. For example, you can add a small water sensor behind your washing machine or under your sink. If a pipe or hose cracks, you’ll get an instant ‘water detected’ alert, via your smartphone app, text message or email, enabling you to act quickly before major water damage occurs. In a smoke or carbon dioxide event, you can have your neighbors alerted too: simply add them to your alerts list and they’ll be forewarned of any danger. 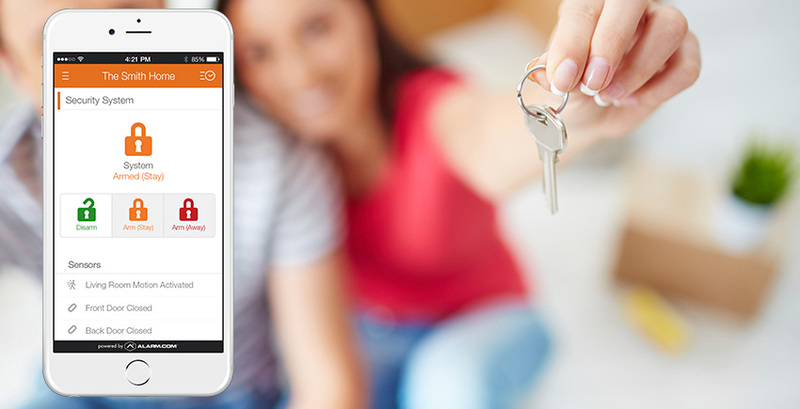 Smart Home alerts also help you keep track of other important things. You can be the first to know when a package arrives at your door, or if your dog walker fails to show up. You probably won’t be familiar with your new home’s energy bills until you’ve lived there for a year, but you can start lowering them right away with an Alarm.com Smart Thermostat. Our smart thermostat is smarter at saving energy because it’s integrated with your security system and knows what’s happening in and around your home. It can make some very smart decisions, such as setting back automatically if you leave a door open for too long. It can use your smartphone location to automatically save when you’re away, and it can even adjust for very hot or cold weather. What’s the first thing you plan to renovate in your new home? If it’s a big job, you’ll be working with contractors, and a Smart Home helps you securely manage contractor access without taking time off from work to be at home. Smart locks, user codes and real-time alerts allow you to provide easy access to your home, whether you’re there or not, while maintaining the security of your property. And with video monitoring on your smartphone, you can even peek in to see how the job is going. Interested in making your new home a Smart Home? Our nationwide network of dealers can do it all. Click here to get connected today!